Lock in a great price for Rodos Niohori Elite Suites Boutique Hotel – rated 9.6 by recent guests! Isabell and the staff made the experience there wonderful. Made us excellent breakfast and gave us helpful travel advice for both Rhodes and Greece. Very helpful to even offer a ‘takeaway breakfast’ for an early check out. 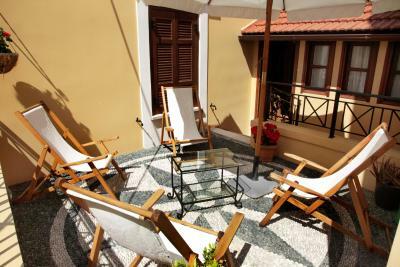 The rooms are spacious and the little terrace area is very nice. 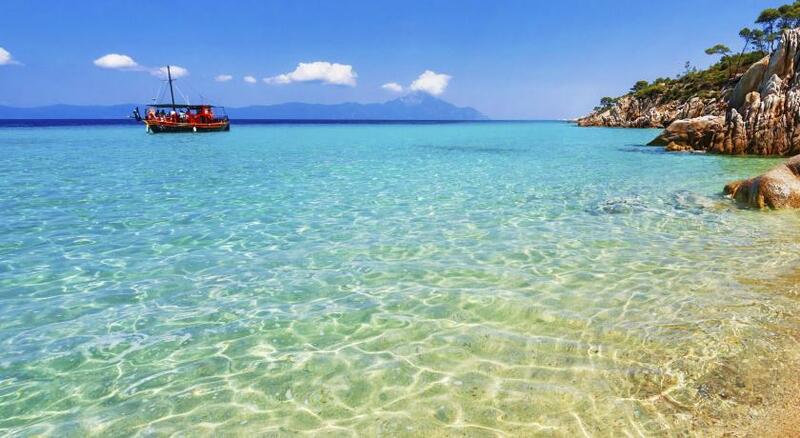 Truly a relaxing place in busy Rhodes. Great restaurant advice also given to find good food in a very touristy place. Isabelle is a great host and very helpful. Very good breakfast. We had 8 wonderful days at Rodos Niohori Suites, and were made incredibly welcome by the lovely Isabel and Violet. Isabell was a wonderful and attentive host and went out of her way to recommend local restaurants and places to visit in Rhodes as well as making us feel incredibly welcome. 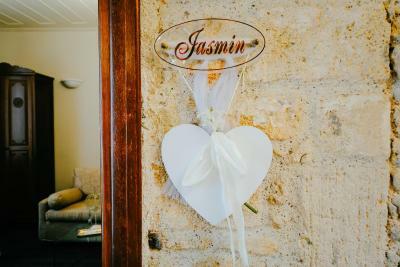 The apartments are beautifully decorated and spacious, and the breakfasts were delicious. Wonderful helpful hotel staff. Excellent location in the heart of the town. Quiet place in the middle of noisy downtown. Spacious bathroom. Good A/C. Everything was perfect. The hosts and crue were amazing and made our trip unforgettable. The location is excellent, the service by Isabell and Violet is excellent, the apartment is very nice and perfectly clean. It is quite even if in the middle of the city. There is an interior garden and a private balcony/patio upstairs, great stuff. Air conditioning works perfectly! The breakfast consists of very nice assortment of breads/croissants, delicious confiture and marmalade, Greek yogurt, choice of eggs, cereal, etc, etc. They even gave us beach towels! We loved to stay Niohori Elite suits. Next time we will stay again. Thank you İsabel& Violet. Rodos Niohori Elite Suites Boutique Hotel This rating is a reflection of how the property compares to the industry standard when it comes to price, facilities and services available. It's based on a self-evaluation by the property. Use this rating to help choose your stay! Each Niohori two-story suite is fitted with Italian furnishings and a touch of Italian décor. They all have a private terrace with sun loungers and an umbrella. A dining table for 4, a seating room and 2 bathrooms are featured. 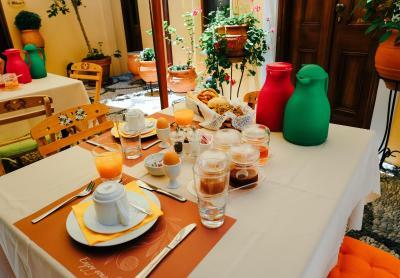 Rodos Niohori Elite Suites serves a homemade breakfast, including fresh fruit, at the communal courtyard. Free WiFi access is offered throughout. Rhodes’ nearest sandy beach is 1,000 feet from the suites. The lodging is easily reachable from Diagoras International Airport, 8.7 mi away. 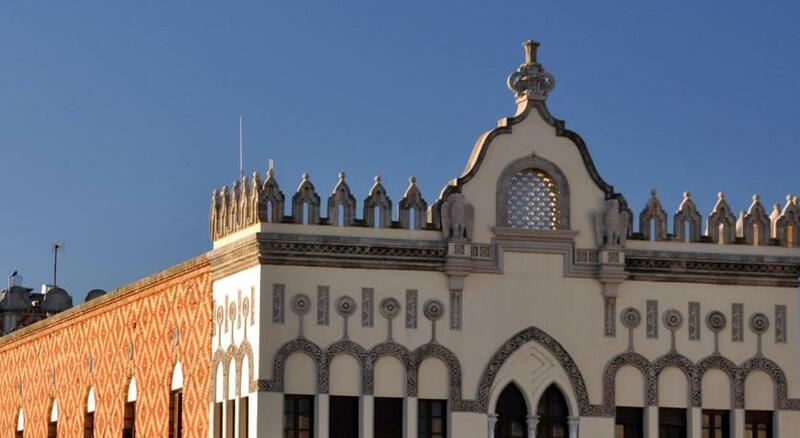 The medieval town of Rhodes is 0.6 mi away, while bars, clubs and restaurants are within 500 feet away. Elli Beach and the Aquarium are within proximity. 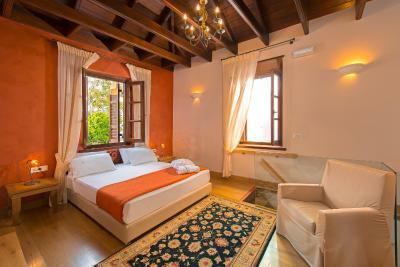 When would you like to stay at Rodos Niohori Elite Suites Boutique Hotel? 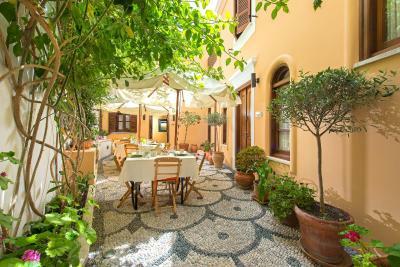 Opening to a private, pebble-paved terrace with sun beds and an umbrella, this 2-level suite has a ground-floor living room with sofa bed, and a Nespresso coffee machine. A traditional, stone-built laundry room and cooking hob, a spacious bathroom with black mosaic tiles, and a dining area for 4 are also included on the ground floor. On the first floor, there is a romantically decorated bedroom. Please note that breakfast is served in the communal garden area, in front of the suite. Featuring a private entrance and a pebble-paved terrace with sun loungers, this 2-level suite has a spacious, romantically decorated bedroom with walk-in wardrobe. 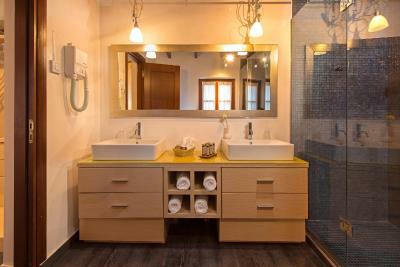 It offers a large bathroom with mosaic details and double showers, and a living area with sofa bed and a second bathroom on the ground floor. 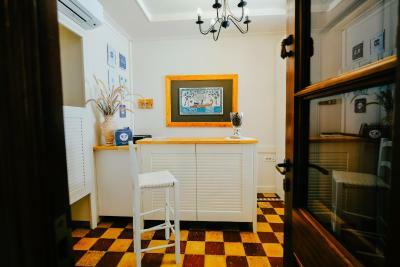 A Nespresso coffee machine, an electric kettle and a mini fridge are included. Fitted with beamed ceiling and a wooden staircase leading to the bedroom, this split-level and air-conditioned suite is romantically decorated. 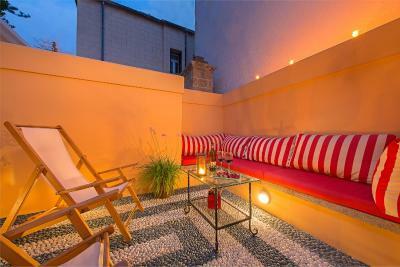 Opening to a pebbled, furnished terrace, it offers a seating area with sofa and flat-screen, satellite TV. A Nespresso coffee machine and a mini fridge are included. 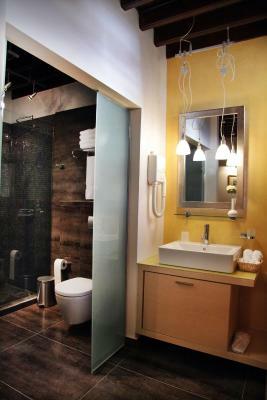 One bathroom is included in each floor. 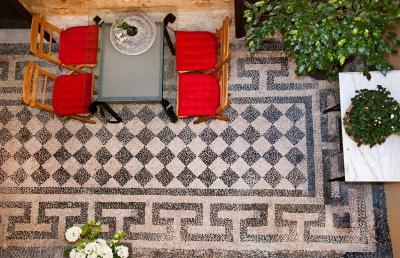 House Rules Rodos Niohori Elite Suites Boutique Hotel takes special requests – add in the next step! Rodos Niohori Elite Suites Boutique Hotel accepts these cards and reserves the right to temporarily hold an amount prior to arrival. Please inform Rodos Niohori Elite Suites Boutique Hotel of your expected arrival time in advance. You can use the Special Requests box when booking, or contact the property directly using the contact details in your confirmation. Very loud cricket singing behind the door from dusk till dawn EVERY night. The sofa bed downstairs was a bit noisy when someone turned and tossed during sleep. Parking not available directly at the hotel and wifi at times got quite slow. Overall, Rhodos is a very touristy experience i will never return to - the hotel was our highlight. This place is a real little gem, tucked away in the old town. Immaculate, free bottle of wine in the room, brilliant breakfast. Super friendly. Stay whenever I'm in Rhodes town. The host was very helpful. The place is near to the beach and to the old city. My only complaint is to booking.com, for not making it very clear on the app that this hotel did not have a cancellation policy. This came as a shock to me cause then i was short of money. The hotel was so good that i do not even wanna complain for not being able to cancel though. Isabell and Violetta are the best staff I have met in any hotel, ever. They did everything to make me and my mom feel like home. Great taste in decoration, super clean rooms, delicious breakfast, awesome suggestions on what to do in our limited time there in Rhodes from Isabell... It was the perfect stay from A to Z. Great: variety for breakfast , showers, beds. Even though the bathrooms were pretty spacious, the showers were a little too small. The personnel was incredibly welcoming and nice. They were very helpful and warm. The rooms were large, very clean and overall very comfortable. The breakfast was a very delicious mix of Greek produce and was tailored to our personal preferences.